We celebrated Dussehra yesterday! Dussehra is a Hindu festival which is celebrated all over India under different names and ways but all have a common reason – celebrate the triumph of good over evil. According to Hindu mythology, Lord Rama worshiped Goddess Durga who is an epitome of the nine aspects of a woman – strength, patience and kindness being some of them. Lord Rama asked for all those powers from the goddess to help him fight Ravana (evil) – the abductor of his wife Sita. He worshiped the goddess for nine days and finally defeated the evil on the tenth day which is celebrated by Hindus all over the world as Dussehra. Hindus believe that little girls are a form of goddess and she is smiling over families that are blessed with little girls. So during the nine days before Dussehra that are also called Navratri (Nav-nine and Ratri-nights) we worship all the nine strengths of a woman and on the ninth day the little girls or ‘goddesses’ are pampered a little extra. We dress them like dolls, we wash their feet and then we serve them some GOOD food! So it was time for our little monster goddess to be pampered as well. That’s my little goddess right there rocking her traditional Indian attire and busy talking to her friend SPIDER! There are a few restrictions in regards to food that is served today. It should of course be vegetarian with not even onion or garlic as ingredients. So the food is very simple with no spices or garam masala or even chili. I just thought it would be interesting for some of you to see how Indian food with almost little or no spices can taste good and look appealing. Here’s what was on the menu. Mix flour salt and ajwain seeds together and make a dough out of it using water just like you make a Roti dough. 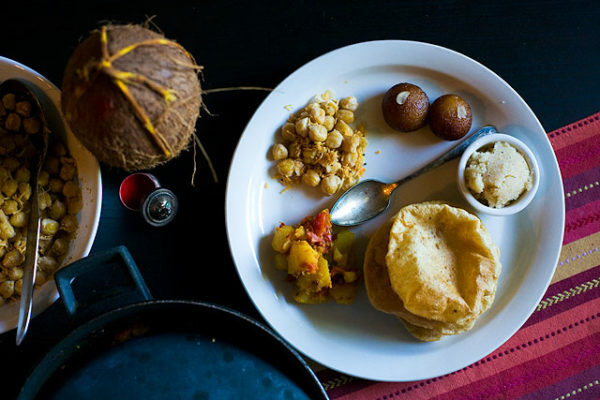 If you want a step by step method of how to knead a roti/poori dough click here. 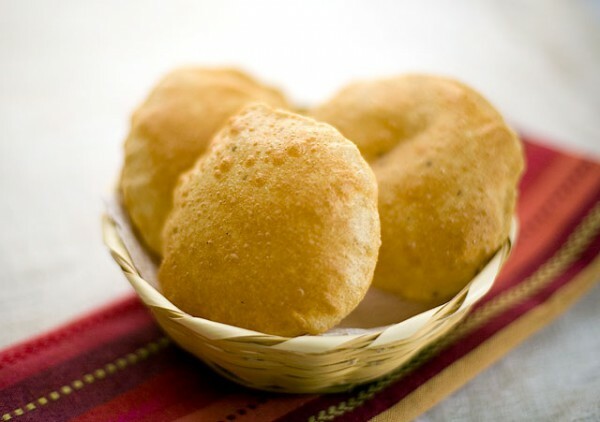 Poori dough is just a little tougher than a roti dough so you need to add comparatively less water. Roll out the dough into 3-4 inch circles and then deep fry them. Poori will puff into little balls when fried and when both sides have turned golden brown (which would take seconds if oil is hot enough), take them out and let excess oil drain in paper towels. I took a little short cut with this and if you have to make so many things on the menu and have less time this is the way to go! Just go to the store and buy an instant Gulab Jamun mix. It would make your life a little easier and it tastes the same! Mix cardamom to the Gulab Jamun mix and then add milk slowly and try to knead a dough out of it (Indian cooking involves a lot of dough kneading but once you get a hang of kneading a Roti dough then rest all is very easy. Just a little variation of water to flour ratio here and there). First cover the dough with a damp towel. Then grease your palms with a little butter or oil and make tiny balls out of the dough. To make the Gulab Jamuns taste even better, my mom presses the balls in the center to make a little hole, add a raw sugar crystal and then make the balls again. Doing this when you deep fry them the sugar inside melts and makes the Gulab Jamun sweet from the core. Deep fry the balls until they are really brown. Now make sugar syrup by boiling sugar and water for about 5-8 minutes. Turn off the heat. Drop the deep fried balls (Jamuns) into the hot sugar syrup and cover with a lid. This will help the Jamuns soak the liquid and they will puff up to double their size. There was another sweet dish in the menu. Sooji (semolina) Halwa with saffron but it didn’t turn out the way I would have wanted it to so I didn’t felt like sharing the recipe here. The day I’m satisfied with the result I’ll share it with you. Boil the whole potatoes with skin on until you can poke a fork into them. Set them aside and let them cool enough to be peeled. Then cut them into small chunks. Meanwhile heat oil in a thick bottom pan. Add cumin seeds and when they start popping add tomatoes to it. Cook the tomatoes well. Add salt and turmeric and cook the tomatoes until they loose their skin. Now add the potatoes and mix it all together. Cook for 3-4 more minutes. And its done! If you are using dry chickpeas, soak them in water overnight. Boil them with lots of salt in a pressure cooker. If you are using canned chickpeas, clean them well with tap water and then boil them with a hint of salt for about 5 minutes. When cooked, drain excess water and set it aside. When mustard seeds pop add grated coconut. On a medium low heat cook the coconut for 2-3 minutes then add chili powder. Mix and add boiled chickpeas. Mix everything together and the dish is ready. My favorite indian recipe. I’m cooking this right now. We love your recipes, especially when its on Tamatar Aloo. You have shared some nice information about Tamatar Aloo in this post. I love poori during pujas too 🙂 especially with aloo and tomatar. (and kalakand and gajar halwa 😀 ) Your pictures are beautiful and the food looks delicious! Lovely festive spread. Great clicks too. I’ve recently been introduced to Indian food and I have to agree that all of this looks incredible, even without the normal amount of spices. Yummmm! Found you from Tasty Kitchen. We spent 9 weeks in India last year with a group with ages from 18-70. Every one of them fell in love with gulab jammun and we never got on a train or bus without 2 or 3 boxes of them, most of which were shared with our happy fellow travelers. Thanks for this glimpse into Hindu culture – very interesting to see all the flavourful Indian food sans curry. 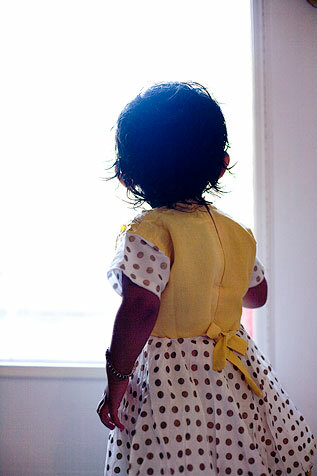 PS: Your little princess looks gorgeous in her outfit! All this food looks heavenly!!! I’m leaving for India soon to visit relatives, so I am definitely looking forward to feasting on all this yummy food. Wish I had some right now though, lol. oh man I love indian sweets! Who knew you could just go buy a mix for that! I need to go investigate this now – thanks for the tip. ps love the addition of ajwain in the puri. I had some wonderful gulam jamun while in Rajasthan. I would love to try to make my own, but i think it’s going to be hard to find the gulam jamun mix! Gulab Jamun – Can’t believe you have a recipe for this – we had it a friend’s house and it is true, one is not enough! Can’t wait to make them! Prerna our daughters are similar ages. Mine is 14 months. Seeing her picture in front of the window made me a little teary eyed. They are growing so fast and I wish I could slow down time just a little bit. Beautiful tradition. I love that 9th day. All the food looks so yummy Prerna! I didn’t know the custom is to prepare food that is low on spices on dussehra. I just learned something new about my country here! What a beautiful and simple meal! Hindus in the Caribbean celebrate Dussehra too! It is times like these I miss living in Guyana because I know I would have been feasting on some great food! I am a big chickpea fan. I have to try the chickpea dish first. the other look great too though! Beautiful! These recipes look great and I loved reading the Hindu history! I love festivals & food, it makes everything so special & memorable! Love Gulab Jamuns but I was never brave enough to make them! Perhaps I’ll come over to your house for some! It must be like a totally different dining experiance for you without all the spices and chillie. Looks lovely still. I love all the traditions and flavours. Wonderful! Amazing menu. Gulab jamuns look divine. Perfect festive meal,all the dishes have come out very well and the clicks are too good. Wow everything looks so delicious. What a lucky girl you have :). How beautiful. Thank you for sharing and what a wonderful festival to celebrate– love it! I wish we were friends and neighbors, b/c we have food envy every time you post something new! Such a delicious spread here; a feast fit for celebration. My dad had coworkers over one time who brought homemade gulab jamun and rasmali — beyond amazing! Lovely recipe and great photographs!! There is an Award waiting for you on my blog. Please come and collect it when you can. Hi, great recipes as always. Potato with Tomato looks heavenly, simple yet mouth watering. I tried your aloo gobi, and channa masala and both turned out perfect. I love the way you keep things simple. Sorry if I’m nitpicking but should the first line in Tamatar Aloo – Potato and Tomato recipe be 2-3 medium size Potatoes? Oh that food does look good! Sometimes the simple foods are the best! I absolutely love that dress your little goddess is wearing. What a wonderful tradition in a world that seems to honor boys over girls. Thanks for sharing this with us! I love the meal. You know in A’s home they use onion garlic during pooja.. I had never heard of that till I started getting accustomed to his culture. This is the kind we have at home.. halwa, poori, some kind of plain alu subzi and some kind of dal/chana (usually a sweetish chana dal). Happy dusshera to you and your sweet family. Thanks for filling me in. I love learning about celebrations that focus on food 🙂 I love your little girl’s dress, too. So precious. Very interesting post! Love your little girl pic and the food recipes and pics. Also, I did try your curry hard-boiled eggs and I LOVE THEM! First click is gorgeous.. cute girl. Its awesome meal and looks divine with ur beautiful clicks… Jamuns are really tempting.. Thats coincidence i too posted same kind of bowl which i love a lot. What a gorgeous meal! Those are all specialities I have never eaten but would love to taste.